Senator Mark Udall, right, Democrat of Colorado, during a news conference by the shore of St. Vrain Creek in Lyons, Colorado, on Friday. When we officially launched our forecast model two weeks ago, it had Republicans with a 64 percent chance of taking over the Senate after this fall’s elections. Now Republican chances are about 55 percent instead. We’ve never quite settled on the semantics of when to call an election a “tossup.” A sports bettor or poker player would grimace and probably take a 55-45 edge. But this Senate race is pretty darned close. What’s happened? The chart below lists the change in our forecast in each state between Sept. 3 (when our model launched) and our current (Sept. 15) update. As you can see, there hasn’t been an across-the-board shift. Republicans’ odds have improved in several important races since the launch of our model. Democrats’ odds have improved in several others. But the two states with the largest shifts have been Colorado and North Carolina — in both cases, the movement has been in Democrats’ direction. That accounts for most of the difference in the forecast. Republican defenses (Georgia, Kansas, Kentucky). These are the three Republican-held seats where Democrats have some chance for a pickup. Democrats got good news in Kansas two weeks ago when their own candidate, Chad Taylor, ceased his campaign in the state — improving the odds for the center-left independent candidate, Greg Orman. Orman, however, is a slight underdog against the Republican incumbent Pat Roberts, and Orman isn’t certain to caucus with Democrats if he wins. Meanwhile, Democrats’ odds have declined somewhat in Georgia and Kentucky. Taken as a group then, these states have not produced much change in the overall forecast. Highly competitive purple states (Colorado, Iowa, Michigan, New Hampshire, North Carolina). These are the five competitive Senate races — all seats are currently held by Democrats — in states generally considered presidential swing states. It’s here where Democrats have gained ground. There have been numerous recent polls in North Carolina, including two released on Monday, showing Democratic Sen. Kay Hagan ahead. Her odds of holding her seat have improved to 68 percent from 46 percent when the model launched. Colorado has followed a similar path, with Democratic Sen. Mark Udall’s chances of keeping his seat improving to 69 percent from 47 percent. Democrats have also made smaller gains in Iowa and Michigan. New Hampshire has been an exception. The model isn’t buying that the race is tied, as a CNN poll implied Monday, but it does have Democratic Sen. Jeanne Shaheen’s chances falling from 81 percent to 75 percent. Republican reaches (Illinois, Minnesota, New Jersey, Virginia). These states are only on the fringe of being competitive and haven’t received much attention from the news media or from pollsters. But each has been polled at least twice since our model launched. Those polls haven’t shown Democrats gaining or losing any ground — but they have confirmed Democrats are ahead, often by double-digit margins. Our model shows more confidence as the volume of polling increases, so these polls have also slightly helped Democrats. 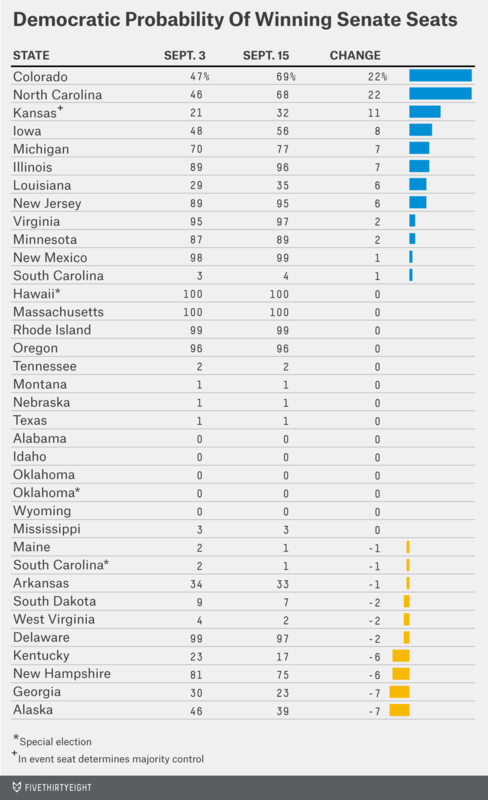 Most of the Democrats’ gains, however, have come from the purple states. What’s perplexing is that this has happened right as Democrats’ position on the generic congressional ballot — probably the best indicator of the national mood — has deteriorated. Historically, the generic ballot and state-by-state Senate polls — while not perfectly correlated — have moved in tandem more often than not. On average since 1990, a one-percentage-point change in the generic ballot has translated to a half-point change (in the same party’s direction) in the average Senate race. Might Democrats be benefiting from strong voter outreach in these states — perhaps the residue of President Obama’s “ground game” in 2012? You could make that case in North Carolina, where two polls released on Monday showed a smaller gap between registered and likely voters than most other states that have been polled this year. But this story isn’t so consistent. By contrast, CNN’s poll of New Hampshire on Monday had a conspicuously large turnout gap. And in 2010, presidential swing states showed an especially large turnout drop-off for Democrats. Money could be a more important factor. Consider the states with the largest polling movement: In North Carolina, Hagan had $8.7 million in cash on hand as of June 30 as compared with just $1.5 million for her Republican opponent, Thom Tillis. In Colorado, Udall had $5.7 million as compared with $3.4 million for Republican Cory Gardner. Whatever the reason, the GOP’s path to a Senate majority is less robust than before. They still look pretty good in the “path of least resistance” states. But while West Virginia, Montana and South Dakota are extremely likely pickups, Alaska, Arkansas and Louisiana are not sure things. Meanwhile, Republicans have fewer top-tier backup options, as states like North Carolina and Colorado have trended away from them. Republicans may need to decide whether to consolidate their resources. It won’t help them if they lose each of Colorado, Iowa, New Hampshire and North Carolina by a couple of percentage points — and in the process blow a state like Arkansas.